German automaker Porsche exclusively manufactures high-performance cars and SUVs and is considered a luxury brand in the U.S. Porsche is known for horizontally opposed 'boxer' engines, often rear-mounted, which historically were air-cooled. Now all Porsches have conventional liquid cooling. Though all of Porsche's platforms are rear-wheel drive, Porsche was a pioneer in the use of all-wheel drive for performance rather than foul weather, starting in versions of its legendary 911. Introduced in the 1960s, the 911 continues in coupe, Targa (semi-convertible) and convertible forms, with rear- or all-wheel drive. The ultimate Porsches, which fall under the 911 umbrella, are the Turbo S and the GT2. Porsche's most affordable cars are the Boxster two-seat convertible and its sister, the Cayman coupe. Porsche's latest addition is the Panamera sedan, Porsche's first four-door car, which provides seating for four. Porsche's Cayenne crossover/SUV, now in its second generation, became the brand's best-selling model despite widespread criticism of both the company's decision to build a truck and its execution of a heavy, off-road-capable SUV. The new version is lighter and has improved road manners, and it offers an optional hybrid drivetrain, Porsche's first. The Cayenne shares its platform, hybrid system and a six-cylinder engine with the Volkswagen Touareg. Porsche has a long-standing partnership with Volkswagen, whose original Beetle was designed by Porsche founder Ferdinand Porsche. In a complex relationship, the small but ever-profitable Porsche is the majority shareholder of VW with more than half of the voting rights. 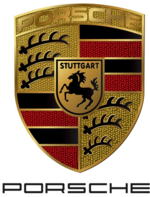 Porsche AG and its parent holding company are headquartered in Stuttgart, Germany.